A concerned Carnegie resident has reviewed Council’s Concept Plan for Carnegie and come up with some alternative suggestions. To gauge community feedback a 10 question survey has been prepared – each of the questions allows you to provide alternative suggestions or make additional comments. 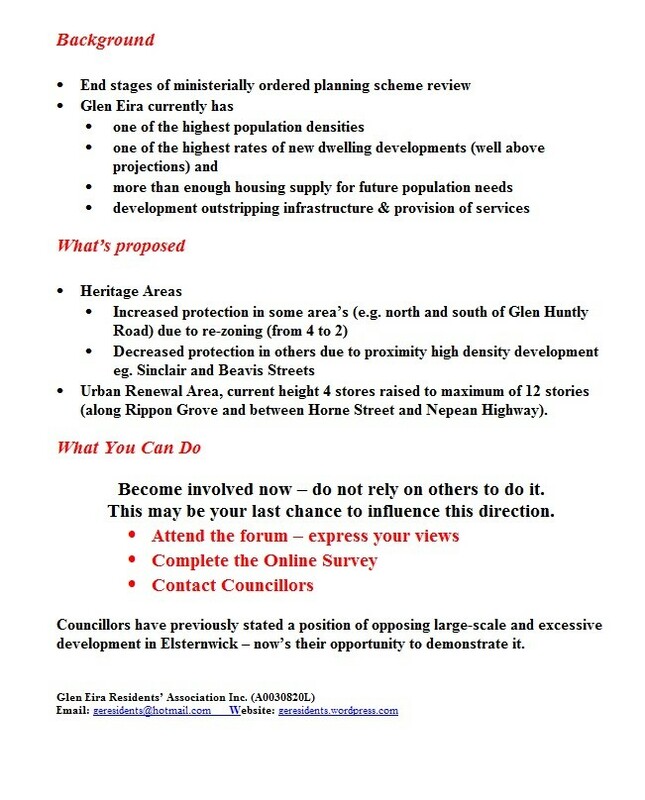 GERA urges residents to complete the survey. 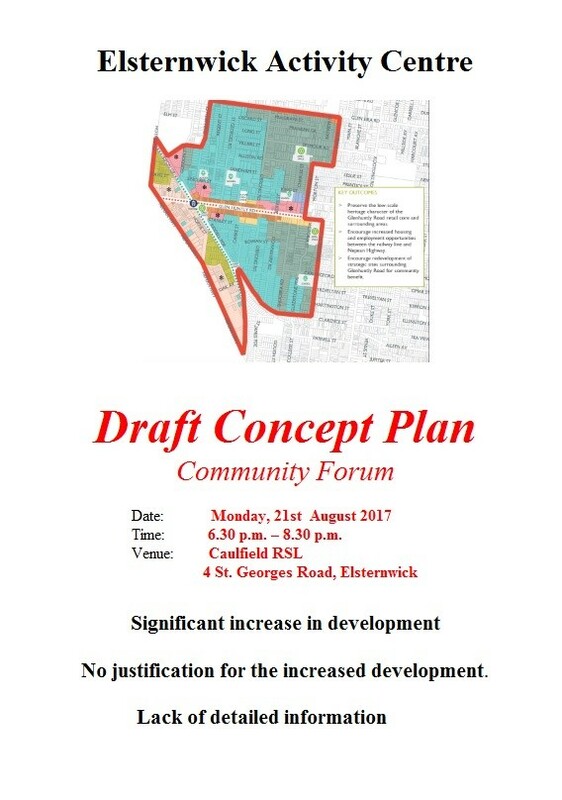 Great turnout of residents (110+) at tonight’s (14/8/2017) Carnegie Concept Plan Forum – additional seating was required. Unfortunately the same can’t be said of Councillor attendance – only two Councillors (Cr. Anthanasopoulous and Hyams) attended. Equally unfortunately, residents’ questions which required a detailed response were deferred until next (and last) community input session. Lack of detail provided to justify expansion of centre boundaries and height variances within those boundaries. Lack of quantification on outcome of proposed changes and meeting State Government targets. Traffic and Parking management and pedestrian connectivity needed improvement. Vehicular flows to be directed towards main roads and parking areas located away from residential streets and high traffic pedestrian areas. Open space – need for increased provision of accessible open space. What is Council proposing and how will it be financed. Need greener and lower density development away from centres core – residential areas reserved for residential developments. Interface with Public Realm needs improving. Urban Renewal interface with Chesnut Street heritage area, Skyrail and areas south of the rail line – need for additional information. Protection of Neighbourhood Character and Heritage Areas – need to retain Carnegie’s uniqueness. Core retail area redevelopments to retain/incorporate Koornang Road’s historic facades. Much of the table talk and post forum informal discussions, while expressing favourable responses to the concept of “the right building in the right location”. also expressed major concerns re limited detail provided, an expected deluge of information for the final Forum (October) and overall Council planning performance. highlights the need for residents to “stir from slumber” and become involved. As per Council’s “Life Cycle” ( bottom right of page) review process – Carnegie is currently at Stage 5 of an 8 stage Structure Planning process. 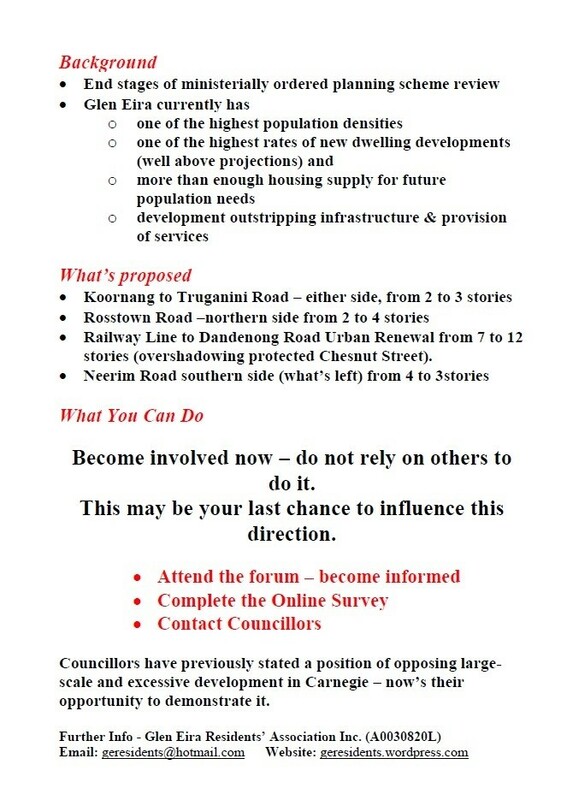 Since stages 7 & 8 relate to Council and Ministerial review and approval, Monday’s Forum (Carnegie 14/8 & Elsternwick 21/8) and October’s Stage 6 (Draft Structure Plans) Forum are the last remaining opportunities for community input. With the release of the Concept Plans the “nitty gritty” is just beginning to appear. Some areas have increased height limits, others decreased height limits – overall development opportunities have increased. Yet, little or no justification has been provided and no assessment of the flow-on impacts has been included. October’s Structure Planning Forum promises to be a “doozey” – a wealth of information with little time to digest. Residents, who live in or around a centre or who frequent a centre, owe it to themselves to become informed and express their views at the two remaining forums. Within the centres, the 2013 zone implementation is not providing diversity of housing – the extra legwork was not undertaken. Adopting the concept of “right building in right locations” is a positive step towards addressing this issue. GERA believes the review of the Carnegie should include Glen Huntly (flagged to become major activity centre) and Murrumbeena. 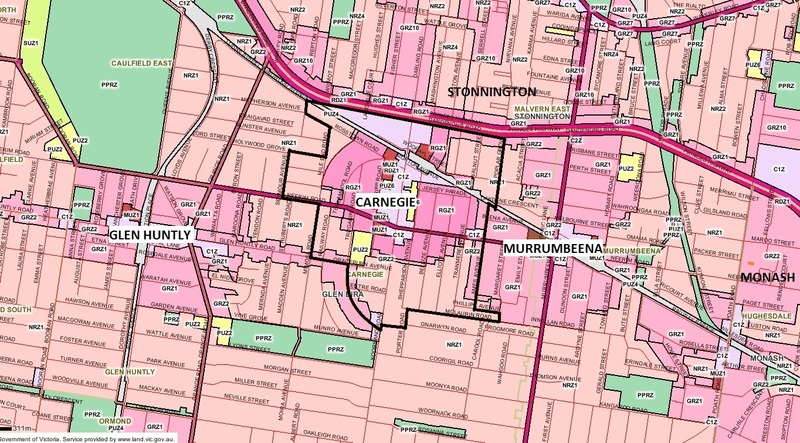 South of Neerim Road and Dandenong Road, the Carnegie and Murrumbeena centres have merged and with the expansion of the Carnegie boundaries it also merges with Glen Huntly. 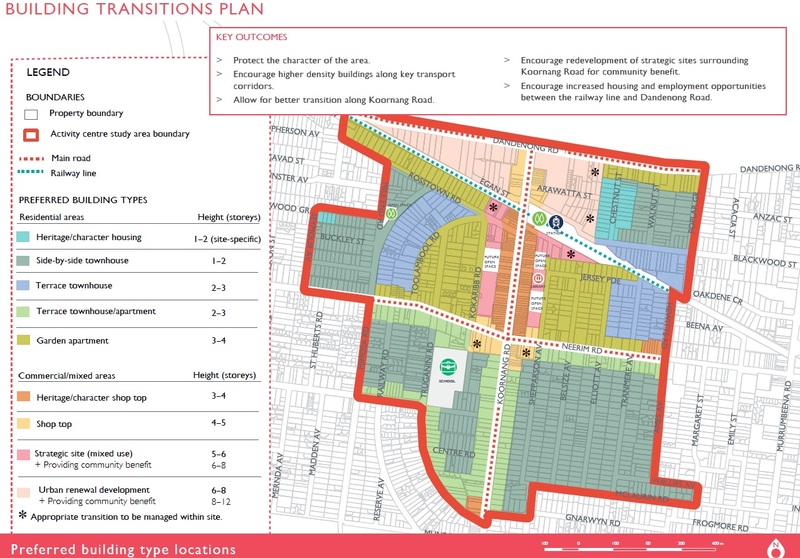 As yet no details on changes to the boundaries of Murrumbeena or Glen Huntly are available (scheduled for a later Structure Plan exercise), however, residents believe they too will expand. Within the context of a relatively small area, the provision for future development will be huge, as will the flow on impacts (eg. traffic, parking, open space). GERA believes it is inappropriate for these centres not to be reviewed concurrently. Factoring in the future level crossing removal in the 3 centres, adds emphasis to a need for a concurrent review. 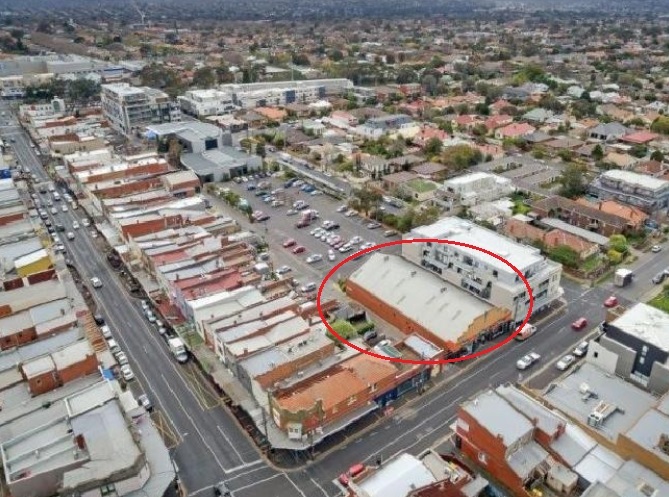 Similar issues are likely to exist for the above – eg the 5 storey building being constructed on the Cnr of Rosstown/Kookaribb, 4 stories on the Cnr Kookaribb/Neerim and the 5 stories Truganini Road (next to the Carnegie Primary School) are not included. Questions of accuracy aside – the highlighted permits present a disturbing picture of the past 4 years and, since they will remain for decades, a serious challenge to future Centre development as presented in the Concept Plans. 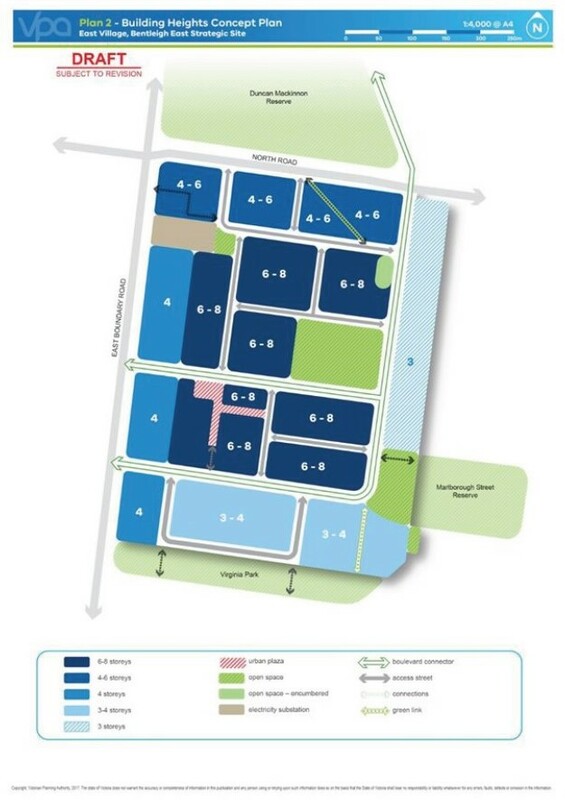 The Centre’s boundaries have been extended to include substantial established residential areas. 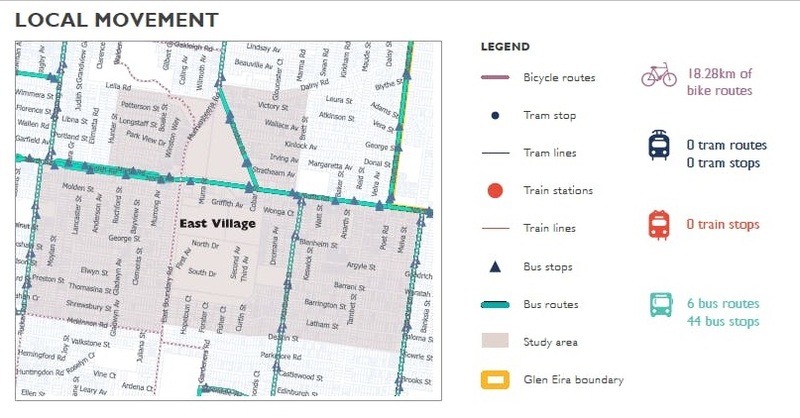 At the Bentleigh Forum, Council advised that these boundaries, which align with the road network, were in line with a 10 minute walk to the train station. Assuming the same applies to Carnegie, it’s likely to involve a much longer walk from south eastern jut (Phillips Avenue) or from the western Seymour bulge (Seymour Avenue). 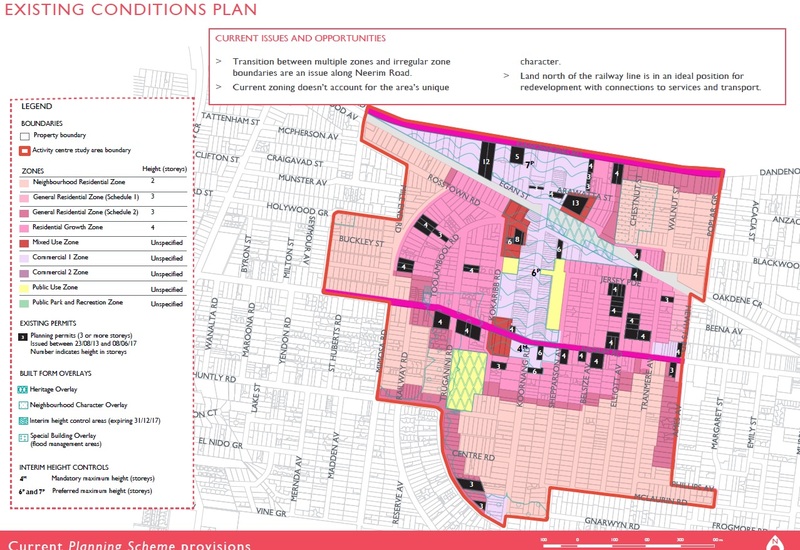 When reviewing bear in mind, Existing Conditions Map, zones and highlighted building locations. As previously mentioned, some areas have increased heights others reduced heights. Some selected significant examples are as follows. what constitutes “community benefit” and “appropriate transition to be managed within site”. Potential dominance of the Chesnut Heritage Area which unfortunately retains a 4 storey height limit along Dandenong Road. Commercial and Mixed Zones, Koornang Road from Railway line to Neerim Road. Subject to preferred interim height control (DDO9-2) of 7 stories – proposed maximum height limit reduced to 4. Koornang Road south of Neerim Road to Truganini Road currently two stories increased to 3. Toolambool to Mimosa currently 4 stories reduced to 3. Area south of Neerim Road between Ames Ave and Koornang currently classified as 4 and 3 stores reduced, height limit on Neerim Road reduced to 3. 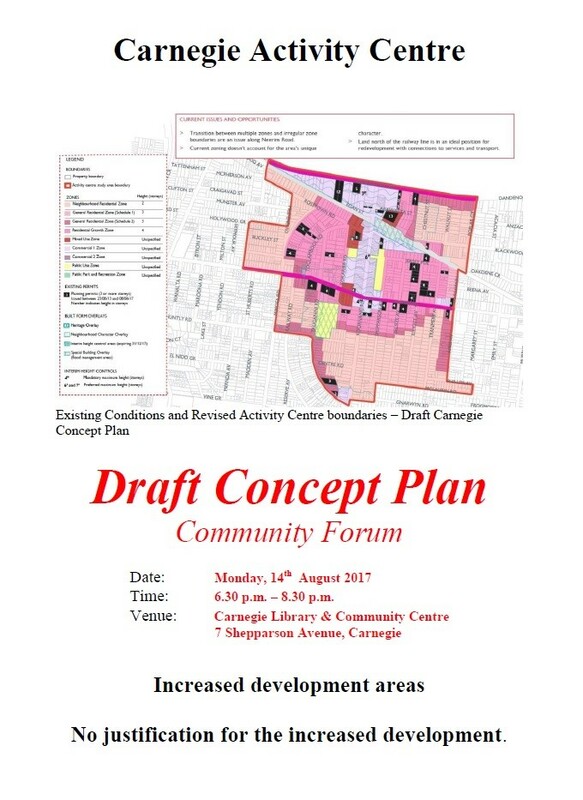 The following flyer has been prepared to urge residents to attend next Monday’s Carnegie Concept Plan Community Forum. As per the flyer, the Concept Plan contains some significant changes that residents should be aware of and concerned about. Details of the Forum and Council Concept Plan documentation is available on Council’s website.